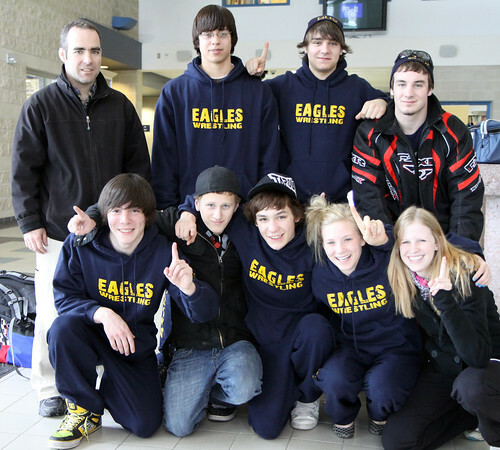 A group of DHS wrestlers are on their way to Tillsonburg today to compete in the OFSAA Championship for wrestling. Andy Brown, Ryan Hansson, Jhan Czajkowski, Jennifer Hutchison, Alex Evans, Devin Lozej, Jessyca Gauthier and Jamie Mesics all qualified in the earlier NWOSSA tournament, and will represent DHS at this Ontario-wide tournament that runs from Wednesday to Friday. We will try to post regular updates here at dhseagles.com. You can also check out the OFSAA Wrestling website here. Good luck wrestlers! DHS wishes you safe travels and success on the mats.